Investors see potential in Robo-advise services and rush in to fund the fintech that is expected to be mainstream in the next three-to-five years. This week robo-advice startup, RiskSave Technologies saw its equity crowdfunding target of £150,000 met in just four days. The company wants the capital to develop and launch its robo-investing platform. The RiskSave platform, which will launch later this year, has assigned a pre-money valuation of £6m and investors still hurried to fund the startup. While I’m not normally one to follow the herd, I was interested enough to dig deeper and find out what the stampede was all about. A robo-advisor is an online wealth management and advisory service that provides web-based or mobile, algorithm-based portfolio management advice with minimal human intervention and which continues to rebalance a portfolio. Analysts say the concept will be the future of asset management because it broadens the reach of investor services and offers lower fees than traditional wealth managers. 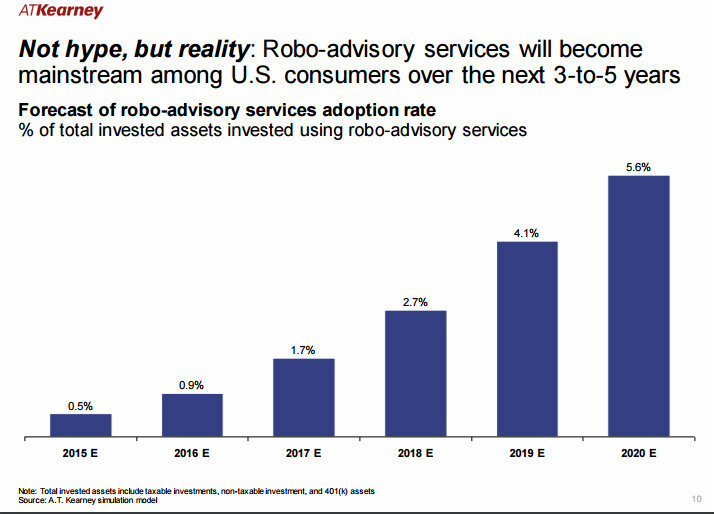 I know very little about robo-advisors, and I’m not alone, an ATKearney 2015 study, Hype vs. Reality: The Coming Waves of “Robo” Adoption, reported that 80 per cent of American consumers are not aware of robo-advisory services. This is set to change, the same report goes on to say robo-advisory services will become mainstream among US investors over the next three-to-five years and the total assets under management will increase by 68 per cent annually to about $2.2trn by 2020. The adoption rates for UK consumers are expected to be aligned with that of US consumers and the pioneers leading the revolution will be millennials. Those under thirty-five, sophisticated risk-takers who are used to living their lives digitally and on the go. Most robo platforms use the same method already applied to conventional portfolio management by human advisors but RiskSave has developed its own concept. RiskSave’s platform aims to bring cutting edge risk management techniques, previously only available to institutions and high-net-worth individuals, to all investors. Its mission is to keep costs as low and transparent as possible. The platform is not yet regulated by the FCA but it intends to become an appointed representative of a regulated firm in the next few weeks. RiskSave’s target raise was £150,000 for 2.92 per cent equity, as of writing the company has so far funded over £180,000. It plans to use the funds from this crowd raise to expand its development team, hire a senior institutional salesman, augment the customer base, and develop new revenue streams. It plans international expansion into Europe soon. RiskSave is expecting to be revenue generating by January 2017. First-year revenue will be retail fees on assets under management and the company expects to onboard 1,000 clients in the medium-term. Institutional fees and software licensing revenue will accrue after year one. The company is forecasting total revenue of £6.6m and a net profit of £5.2m by 2019. Tammas-Hastings has assembled a small but experienced team and is keeping overheads to a minimum by rewarding key hires with equity and not salaries. It's lean operating structure means the company could be self-funding in the short-term but it has not ruled out a Series A round in 2017. The Valuation is understandably a sore point for investors and has attracted the usual inquisition from potential funders. Tammas-Hastings said “We could have gone higher, but we strike a balance between rewarding employees and allowing upside to investors and new joiners - Robo-Advice is a growing industry and on a comparable basis we are priced at a 50 per cent discount if not more. The pitch, running on Crowdcube, gives comparable valuations for other players in the sector. The company sees multiple potential acquirers, these include financial software companies, retail and asset management firms. Otherwise, Tammas-Hastings said a smaller stock market IPO could be a possibility by year four. RiskSave is offering ordinary shares with full voting rights and pre-emption rights for all investors, and it has a minimum investment of £10. A £6m valuation for a company that is pre-revenue and still a few months away from a full launch seems high but the company does have an asset. The founders have transferred all intellectual property (IP) rights relating to the RiskSave model to the Company. This is currently being formalised in an unconditional IP assignment, which will be executed prior to the completion of the Crowd round. I like investments with some IP attached to them because even if an entrepreneur fails to successfully bring a product or service to market, and let’s face it being an entrepreneur requires a unique and broad skill set that not many people can pull off, there is always some residual value in the company that can be realized by selling or licensing the asset. Investors in this round are effectively buying IP and market potential. The company is a player in a pervasive emerging technology trend, fresh opportunities in this sector are scarce and hardly ever accessible for retail investors.